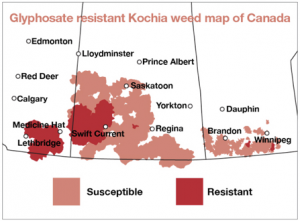 Here are tips to prevent the development and spread of glyphosate-resistant kochia (as shown in the map) and other herbicide-resistant weeds. A pesticide rinsate biobed can prevent the environmental contamination of surface and groundwater by pesticides. 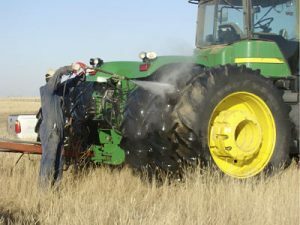 Instead of being disposed of directly on land, at the edge of a field or elsewhere, the rinsate from the sprayer can be applied to the biobed (so it is contained). Residual herbicides need a moist environment for herbicide breakdown to occur within the expected time-frame. In dry conditions, the two major breakdown methods – hydrolysis or microbial degradation – will slow down, which elevates the carryover risk. 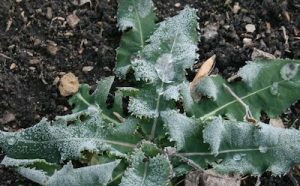 Spray decisions — when to spray or whether to spray at all — will depend on leaf condition after the snow is gone. 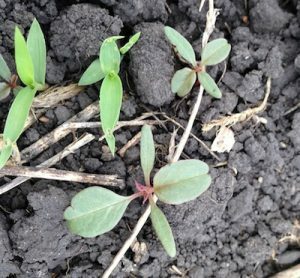 What causes herbicide carryover damage? Factors that affect herbicide carryover are herbicide group, field history, soil characteristics, dry conditions and temperature. Buffer zones or strips come in all shapes and sizes, and are designed to protect sensitive areas. Sensitive areas include permanent vegetation to maintain good water quality (riparian areas around rivers, lakes and ponds), control erosion (shelterbelts) or provide wildlife habitat. 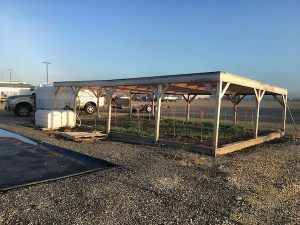 These areas are also typically habitat for pollinators and other beneficial insects. We dug into our vast vault of Canola Watch articles to put together this Top 10 list. Dusty conditions are common in spraying, and in dry springs they are often associated with a further challenge – drought-stressed plants. There is no magic cure for these problems, but Tom Wolf provides these guidelines…. 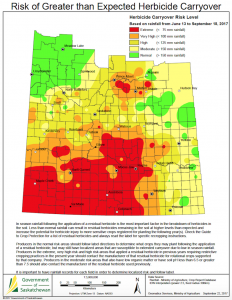 The map shows herbicide carryover risk in Saskatchewan based on summer 2017 precipitation. In-season moisture from last season is the measure that influences herbicide breakdown. We haven’t lost a crop in March, but growers across large parts of Western Canada are concerned about the soil moisture situation. This may influence decisions on seed costs, fertilizer rates and, when the time comes, seeding depth. Dry conditions that started last summer can also increase the risk of herbicide carryover. Going to an auction sale this spring? Before bringing home a new machine, check that it’s clean outside and in. Soil on used drills, combines and basically any field machinery could contain clubroot spores. 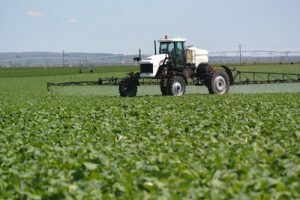 Late herbicide: Is it worth it? Wind and wet pushed back a lot of weed management and some fields are still not sprayed. In this situation, intense weed pressure can reduce yields by 20%, 30%, 50%… That’s why early weed control has a huge positive effect on profitability, but late control is better than nothing. Late control can stop the yield loss, stop weeds from contributing substantially to the weed seed bank, and improve crop harvestability. 1. Use acceptable pesticides only. Only use products that are registered for your crop and won’t cause concerns for customers. 2. Use pesticides correctly. Consult the label for proper rates and timing.